It took five years for Paul Solet to make his second film. 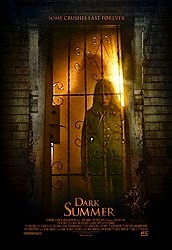 Dark Summer wasn't really worth the wait. Ever since seeing Paul Solet's 2009 horror film Grace, I have been rooting for him as a filmmaker. It was a terrific debut: moody, atmospheric and focused on character. It went to to some really uncomfortable and upsetting places, but Solet earned those moments by staying true to -- and caring about -- the central character and playing fair with the premise he had established. But Grace was a movie that he had written and lived with for years; it was based on his own short film from 2006, giving Solet up to three years to process how he could make it into a feature and just exactly what that would look like. Dark Summer, his first feature in five years, attempts to do a lot of the things that made Grace so effective: small cast, limited scope, an atmosphere of increasing dread. Unfortunately, the results are not the same. He's no longer working from his own script (screenwriting duties fall to Mike Le, an executive producer on something called K-Town) and it shows, as Solet is never able to find a way in to the material. The greatest strength of Grace was the heart-wrenching emotional connection at its center, but there's nothing resembling an emotional connection in Dark Summer. These kids feel dead inside. Would that that were the point. Keir Gilchrist plays Daniel, a high schooler placed on house arrest after hacking the social media accounts of classmate Mona (Grace Phipps), the school's resident weird girl outcast. When his two best friends Abby and Kevin (Stella Maeve and Maestro Harrell) sneak a computer into his house, Daniel receives a message from Mona that ends in tragedy. Unfortunately, that's just the start of his problems. It would appear some spirit is in the house with him, and it's not happy. The budgets for independent horror films have been slashed so much in the last 10 years that sometimes it can be hard to overlook a movie's obvious limitations. There are movies that are smaller in scale and claustrophobic as a storytelling choice and then there are those that are by necessity. Dark Summer feels like the latter. Placing the main character on house arrest is not a function of the film's theme, but rather a justification for setting the whole thing in one uninteresting suburban home (and before it can be compared to, say, Disturbia, Le makes the reference for us). It's not even an excuse to trap Daniel and give him nowhere else to go, as the movie makes it clear that he's the one being haunted -- not the house. I don't mind a low-budget horror movie (and have even made the point that nearly all of my favorite horror films of last year cost less than $1 million and some as low as $2,000), but when I can feel the budget limiting the filmmakers instead of being embraced or transcended, I'm pulled out of the movie. That happened a lot in Dark Summer. Ultimately, I'm not quite sure what Solet is after. Is he making a movie about the dangers of social media, or our own dependence on connecting to one another through the internet instead of in person? Is he making a movie that comments on today's generation of young people? Is it just a standard haunting movie with a contemporary technological twist? A slow-burn possession movie? In one way or another, it's all of these things, but none so successfully that it can safely be categorized as any of them. For as simple as the narrative is, the movie still manages to feel kind of shapeless. That could be more easily forgiven if the movie generated more tension during the long stretches in which Daniel walks around his dark, quiet house. It's obvious that's what Solet is going for -- in lieu of much of a story (or well-written characters, since none of the three have hardly a distinguishable trait among them), he tries to create suspense. The movie comes up short, though not for lack of trying. Solet knows what he's doing; he just doesn't have the tools to get the job done in this case, whether it's the right actors, the right location or just the right investment in what's going on. None of those things are present, so you get an 80 minute movie that feels like its padded when it should feel super tight. The entire movie leads up to a single punchline that's darkly comic and amusing even when it's out of step with the preceding 79 minutes. It also reframes the film as one big "get off my lawn" joke -- these kids with their drama and their social media and their bloody violence. It's the best moment in the movie, so it's not encouraging that it's a) the last few seconds and b) feels like it's from another movie, blackly comic in a film otherwise devoid of humor. I did not care for Dark Summer -- a title only slightly more generic than the film it represents -- but it has not soured me on Paul Solet. Every filmmaker stumbles, and the faults of Dark Summer suggest that there might not have been a good movie in there to begin with. He does what he can with the material, but it's all just too thin. Despite the misstep, I'll still look forward to what he does next and cross my fingers that it's something more personal, more character driven and more substantive. Something more Grace than this. Thanks for this review, Patrick. You know me, I pretty much try to catch all of the indie horror films and I opted to skip this one last weekend. It just didn't look interesting to me at all and this review pretty much confirmed my thinking. Too bad because I love haunted house movies. "The Visitant" (yes, awful title) was one I saw last year that I thought was really good. Micro budget, a ton of practical effects and a lead actress who I thought did a pretty good job especially being on screen for 99% of the run time. The film has it's flaws, like introducing some bad CGI in the third act, but overall it's worth a watch. "I Am a Ghost" is a must watch in my opinion, which was on my top 10 of last year and was my favorite haunted house movie of 2014. I'm actually not the world's biggest "haunted house" fan, but I totally want to check out both of the other movies you mentioned. Thanks! Right on! I don't want to oversell The Visitant, but I like it for it's potential and what it is. I will oversell I am a Ghost though because I loved it. Not for everyone, but really ambitious from a 1st time filmmaker and probably the best title card I have seen a long time (The Conjuring being in 2nd place).